Below is a simple mind map about wedding plan drawn with Edraw mind map software. Users can use this easily customizable mind map template to design their own wedding plans. We spent a lot of time going through every little detail of the wedding plans and what needed to be done. From the order of service to the wedding ceremony, the wedding plan mind map maker help you to cover it all. Just talking through everything and mapping it out in a simple mind map managed to ebb the tide of tears and soon we were looking the monster in the eye and saying 'well, that's not so bad.' You may learn how to create wedding plan mind map here. Wedding Plan Mind Map template can save many hours in creating great wedding plan mind map by using built-in symbols right next to the canvas. 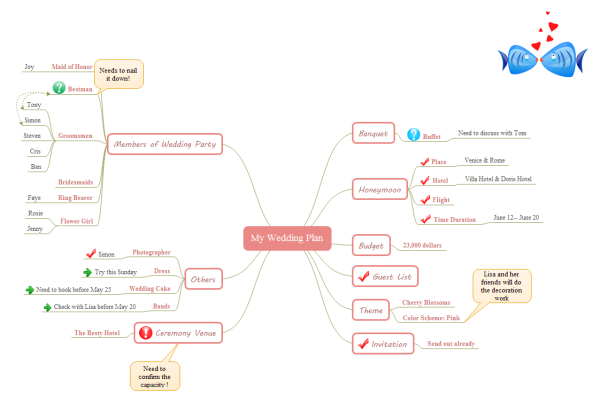 You can download and modify the wedding plan mind map for your own use. One more thing, you may learn to choose dresses for flower girls , wedding seating plan and how to decide who to invite to your wedding here. Also, read how to create career planning mind map here. Discover why Edraw is an excellent program to create wedding plan mind map. Try Edraw FREE.